Earlier this week, Zappos declared they will abandon traditional management structure for holacracy, a management ethos that eschews pyramids and hierarchy in favor of self-organizing groups, called holons. It’s not a structure without management, but one of distributed authority and management. 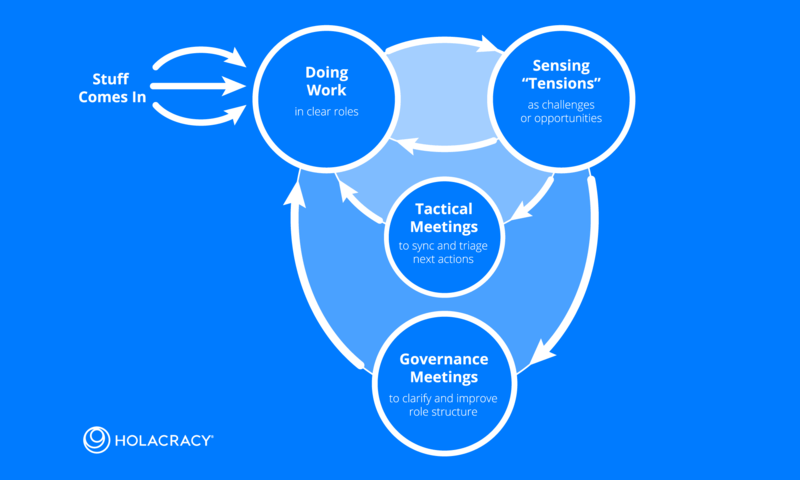 Below is a schematic describing holacracy at a high level. Holacracy has been adopted by a handful of other companies including David Allen’s company, the blogging platform Medium and some non-profits. Valve and 37Signals also seem to have adopted some of these ideas too. But Zappos may be the biggest company to adopt this management style yet. I’m excited to see how the transition goes because Tony Hsieh’s success could start a broad management movement. The biggest challenge for executive teams is attracting, retaining and maximizing the talent of their people. According to a McKinsey survey of 1k+ people conducted in 2009, the top three ways to motivate people are praise from a manager, attention from leaders and opportunities to lead new projects. My understanding is that holacracy was developed in response to those problems. Holacracy should enable employees to create projects on-the-fly and assemble teams as needed. This should make employees more productive and happier. If it works as intended, holacracy should also reduce the amount of time the company’s management team spends on decision-making and general administration of the business by pushing it to employees, granting executives more time to spend with different groups. I’m reading and learning about holacratic management practices at holacracy.org. Some of the questions I have about it are: how does holacracy change the roles of the management team? How difficult it is to train employees in a new working style? Will the benefits of employee happiness ultimately materialize? I’m not certain this structure is right for every organization, or even for which companies benefit most from it, but it does seem like an important management prototype worth digging into.